Life Can Get Better With Age! Here is what the Western industrial nations have forgotten about the elderly. YOU'VE SEEN it on TV and in the ads. Who is associated with the glamorous, throbbingly exciting life-style? Mostly young people. They are at the pulse of entertainment, clothing, cosmetics, travel and advertising in general. That's not to say older people are not featured in the media also. They are. They sell denture cream, painkillers and laxatives. The overall portrayal of old age in Western cultures is negative. Though increasing attention has been focused on the aged, it is usually in the context of "the problem of the elderly." But why should the elderly be considered a "problem" for society? Growing old is a part of life, affecting every form of life. It is a natural process. There is no basic problem involved in determining what part babies, children, teenagers, adults or middle-aged persons play in society. Why should it be difficult to define the role of the elderly? The answer is that it should not be difficult and many Third World societies have proved it need not be. Indeed, in these cases the elderly enjoy a variety of fulfilling responsibilities. In most Western industrial nations, on the other hand, the aging and aged are for the most part left out of the mainstream by a culture that worships youth. Age is the crowning culmination of life — the golden years. It should be looked upon with honor, respect, even awe. It should be an experience made pleasant by the warm attention and support of family members, especially children and grandchildren. If society doesn't consider it in that light, then the problem is with society, not with the elderly! Let's face it. We in the Western world live in a throwaway culture. "No deposit — no return" are familiar words. Wrappings, packaging, string — who thinks twice about throwing them away? And the still perfectly useful items ranging from cars to clothing to kitchen cabinets no longer in fashion or not the latest model? They too are discarded or, if kept of necessity, grudgingly tolerated until they can be conveniently dumped. Planned obsolescence — the idea that what is not new is not desirable — is the credo of the industrial world. It is a way of life many have grown up taking for granted over the last few decades. And so it follows, according to this reasoning, that when people wear out, when they become "old-fashioned," they also are to be put aside. They are confined to a narrow niche labeled "the aged." There, mere spectators of the supercharged society passing them by, they struggle against feelings of uselessness, loneliness, depression and fear. How did this happen? It wasn't always this way. Rapid technological and industrial changes have revolutionized society, have played havoc with the extended family structure. Before the Industrial Revolution significant inventions and discoveries were infrequent. Life followed a fairly predictable pattern. Most people were generally content to maintain ties to the family circle, which in turn was tied to the land. The extended family unit was anchored to a geographical area — babies, children, parents, grandparents, relatives, all together. Witnessed by all was the full cycle of life consisting of its various ages: babyhood, childhood, adolescence, adulthood, middle age and finally old age. The explosion of technology brought rapid economic changes, a shift from a rural to an urban society. Industry and moneymaking opportunities attracted young people to cities. Improvements in modes of transportation made it easier to move great distances from other family members. Rampant divorce, remarriage and alternatives to marriage have split the beleaguered family unit. To a lot of children grandparents are now faraway voices on the telephone rather than a present and real influence in their lives. In a culture that did not change quickly, life had a sense of continuity. The wisdom of the older generation had value to the younger generations because it still applied to the experiences in life. But technology produced such rapid changes in life-style that the experiences of one generation appear old-fashioned to the next. Further adding to the plight of many elderly people is that they have grown up in one mode of life, on a farm, for example. When they move t o a strange city, they fail to fit into the new environment. Today's cities are not places where a person can easily hold on to personal and cultural history. Instead, one feels compelled to conform, to blend into the crowd. Personal identity is threatened, when not totally lost. After a while people begin to wonder who they are and where their roots are. This is especially hard on older people who are suddenly called on to revise the habits of a lifetime in order to adapt to new ways of life. The psychological and cultural stresses of the elderly are made worse by a number of other problems that are a very real part of existence. Many people are in poor health by the' time they reach their latter years. They may run up astronomical medical bills and be unable to care for themselves. Physical danger is not limited to criminal activity. A real but little talked — about danger is "parent abuse." In England it is called "granny — slamming." In growing numbers cases are surfacing of teenagers or adults physically or psychologically abusing elderly parents or grandparents that they are unprepared to cope with. Abuse may range from beatings to heavy doses of sedatives. It is estimated that of elderly people living with family members, 10 percent have been or are being abused. The technology — and industry — based system with its built — in inflation inflicts yet another hardship upon the older generation: economic privation. The real value of small pensions or other fixed income, as well as savings, is constantly being gnawed away by inflation. The price of food, rent, transportation and medical care steadily mounts. The value of money shrinks. And the older become poorer. It is in the industrialized, money-oriented cultures that the custom of retiring older people from the working force is most abrupt and traumatic. A diligent, wage-earning, productive worker at age 65 too often has become in one day's time a nonwage-earning dependent — suddenly old, cast out of the working community. What a waste! You can talk about people wasted by society's neglect of the handicapped. You can point to the lives society wastes when it sends its young men to die in its wars. You can bemoan the lives wasted in society's crowded prisons and on skid row. But society's neglect of the elderly is in many respects the greatest waste of all. Why? For one thing, because they have lived the longest. They are the richest resource in terms of experience in dealing with life and life's challenges. Imagine, if you will, a person going through kindergarten, grammar school, junior high school, high school, junior college, college, doing postgraduate work, sacrificing, working hard, finally obtaining a doctorate in some field, and then being told he must quit and be unproductive the rest of his days. Sound unreasonable? It would be. Most older people have go ne through the "school of hard knocks"; by experience they have learned valuable lessons about handling life's difficult moments as well as its rewarding moments. And what happens when they are at the stage in life where they could share t hat information with younger generations? The younger generations for the most part turn a deaf ear. Modern youth-oriented society as it is set up simply does not warmly welcome the participation of the elderly. It does not as a whole show a genuine interest in the well-being of its senior members. Solving the problem must begin with a change of attitude. The younger generations can begin to show genuine honor and kindness and care. The law of God, as summed up in the Ten Commandments, specifically the Fifth Commandment, strikes directly at the root of this problem: the attitude of the younger generations toward the older generation. The Fifth Commandment stipulates: "Honour thy father and thy mot her" (Ex. 20:12). Your Bible shows how elders should be respected, the place they ought to occupy in a society organized God's way, the way it will be when God restores his government to this earth. Gray hair is to be regarded as a "crown of glory" (Prov. 16:31; 20:29). It is not something to be ashamed of, or that needs to be dyed. Younger people are to "rise up" in the presence of the aged (Lev. 19:32). Their advice and counsel are to be sought and heeded (Prov. 23:22-23). The aged are to be the wisest members of society — here is where some elderly have failed. They are to teach the young the right way to live (Job 32:7; Titus 2:2-5). The Western world has it backward. It has the older generation dependent upon the younger generations. God's way is for the younger generations to be dependent for wisdom upon the older generation (Prov. 13:22; II Cor. 12:14)! The basis of a stable society is a strong, extended family circle anchored to the family property and investments. The world is learning the hard way that once a society cuts its ties with the land and residential property, it sets itself adrift. Notice how the Fifth Commandment in its entirety makes mention of t he land in connection with sound family relations: "Honour thy father and thy mother: that thy days may be long upon the land which the Lord thy God giveth thee." And how might our days "be long"? Respecting and heeding the wisdom of the aged makes it possible to avoid many mistakes, thus promoting a longer and happier life. Aged persons have more than just experience to share. They have ideas, talents, skills and commitment to offer — sometimes to extraordinary degrees. Both the Bible and secular history record remarkable feats accomplished by men and women in their old age. Even in recent years, when the youth-oriented culture has been developing, there have been notable accomplishments by older persons. At 88 Konrad Adenauer was Chancellor of West Germany. In their 80s Winston Churchill, Leo Tolstoy and Alexander Kerenski wrote some of their most celebrated works. Grandma Moses still painted at 101. And what can be said of the music played by Casals, Horowitz and Rubinstein in their senior years? 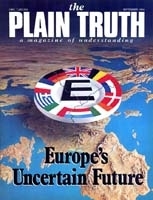 The editor in chief of this very magazine, Herbert W. Armstrong, is President of two colleges, Pastor General of hundreds of church congregations scattered around the world, frequent visitor to world capitals, Chairman •of the Ambassador Cultural Foundation, writer, and regular speaker in personal appearances and on radio and television — all in his 93rd year. There are other outstanding examples also. Unfortunately, most people, when they reach their later years, just do not have the opportunity to do "great" things. Nor are they physically or psychologically up to the task. Many who are lying in nursing homes or who are otherwise incapacitated would give anything to be well enough to function at a fraction of the degree attained by individuals such as those named above. But the reality is that they are not well or strong enough. In such circumstances the tendency too often is just to give up. There are, however, some often — overlooked ways for older persons to make life more fulfilling, whatever may be the condition in which they find themselves. To start with, it is important to hold on to whatever degree of health one has, so an effort should be made to eat a balanced diet, emphasizing fresh rather than processed food, and to be as active as the physical condition permits. Contrary to the line of reasoning that says "you can't teach an old dog new tricks," a person is never too old to learn new knowledge, new skills, new ways of doing things. Some older people are even returning to school or taking up new professions. They are finding it pays to be adaptable and flexible, and to keep an open mind. If you are an older person, why not cultivate new interests by frequenting the public library, watching educational programs on television? Consider participating in group activities, volunteering for community service in libraries, hospitals and such, taking up a hobby, getting yourself a pet. Broaden your horizons as much as you are physically able. As far as relations with the younger generations are concerned, take an interest in young people and children when you have the opportunity. Make yourself interesting to them. One of the complaints young people often make about the elderly is that sometimes they don't share themselves and their experiences, and when they do, it's usually the same story told over and over again. Try not to be repetitive. Strive to keep abreast with what is going on in the world today so you can make what you say relevant. And relax. Look at life and your place in it with a certain sense of humor. Above all, don't live in the past. Live for the future. You may not think you have much time left. But you are wrong! All eternity lies ahead of you. Spend some of your hours studying the Bible — the book that tells you how to attain life that never ends — exciting, vibrant, abundant, rewarding life. Life that will never be dull. Life that will never be slowed down by age. Why not enroll in the Ambassador College Bible Correspondence Course? It's free and you can study it at your own speed. Or, if you have a problem reading, contact us about our tape program for the visually impaired. Learn as much as you can about the Bible. Not only will it make your remaining years more pleasant, but in it you will find the true Fountain of Youth.